So many emotions! What to do with them all? Batman v Superman is a glorious clusterf*ck of a movie, where the awful rubs shoulders with the fantastic. First things first: is this movie better than Man of Steel? Eh…maybe…just? There’s no denying that the prospect of pitting the Dark Knight against the Big Boy Scout is bound to repay the viewer in some way. And when it all gets down to it, I really enjoyed seeing these two go toe to toe. 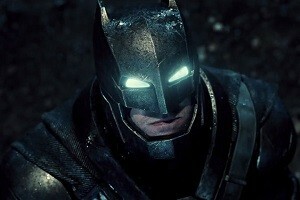 Affleck is playing a version of Bruce Wayne who is completely screwed up. His portrayal is quite distinct from Christian Bale’s. This isn’t a conflicted soul trying to do his best for Gotham; this is a middle aged man who is really, really mentally scarred. (Of course, the notion that after 25 years of being Batman he still hasn’t got over the death of his parents is ridiculous…but there wouldn’t be a Batman if he found peace, would there?) I loved Affleck’s Bruce Wayne, with Jeromy Irons’ Alfred lurking in the background, knowing his master is taking things too far but never taking him to task for it (again, completely different from the Alfred played by Michael Caine). 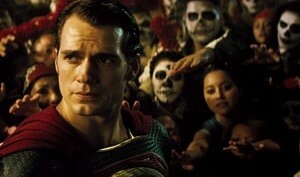 Cavill continues to be good in his role, even if – as suspected – he gets pushed to the side somewhat. Unfortunately, the film still doesn’t explain why he and Lois (Amy Adams) are in love – the two actors have chemistry, but we’re never given an explanation as to why they’re made for each other. In terms of new faces, it’s two of the female characters that leave the biggest impression. Holly Hunter is brilliant as Senator Finch, bringing real gravitas to a smaller role and reminding us just how good the Nolan Batman movies were at casting supporting characters. Gal Gadot makes her first Wonder Woman appearance here, and she does not disappoint. I kinda wished she’d beefed up for the role (sidenote: Affleck clearly hit the gym in a really big way) but there’s no denying that this is great casting. I’m looking forward to her solo film in 2017. Then there’s Jesse Eisenberg. When he was announced in the role of Luthor some time ago, I was one of the few people excited. Surely he’d be playing him like he did Mark Zuckerberg in The Social Network, right? A genius with zero compassion, coldly calculating? Apparently not. For some reason that I don’t think I’ll ever truly understand, Eisenberg plays Luthor like a crazy man. It’s like he really wanted to be the Joker. Now, I haven’t read a tonne of Superman comics, but I don’t remember seeing him played as if he’s completely insane. He doesn’t seem interested in power or influence; he just wants to unleash chaos. It makes little sense and is easily the worst part of this film. Visually, the film is rather bleak. I was hoping that the return of Snyder’s usual cinematographer, Larry Fong, would mean we’d get some more colour injected into proceedings. Unfortunately, this is not the case. Where Man of Steel was washed out, this is simply dark. Almost all the action scenes happen at night-time, and this is the first time I’ve had difficulty following what’s going on in a Snyder movie. Like a rollercoaster ride that’s kinda fun but also that little bit too scary, Batman v Superman is woefully uneven. The good news is that I’ve figured out exactly how Zack Snyder disappoints me. He has these great moments in his films – whether they be emotionally-charged high drama, operatic tragedy or kick-arse action – which are great in principal. But he doesn’t earn them. The groundwork isn’t there, the build-up’s sorely lacking. So whilst I can revel in some of the excess on display, none of it feels justified. The film is worthwhile, and thankfully more than an extended advertisement for Justice League. It also shows us a version of Batman and Superman that we haven’t seen on the big screen before. But it’s a seriously flawed film all the same. This entry was posted in Film Reviews and tagged Action/Adventure, Comic Book, Science Fiction by Stuart Wilson. Bookmark the permalink.